Arianespace’s Ariane 5 launcher has begun its latest mission from the Spaceport, carrying four satellites for Europe’s Galileo navigation system. 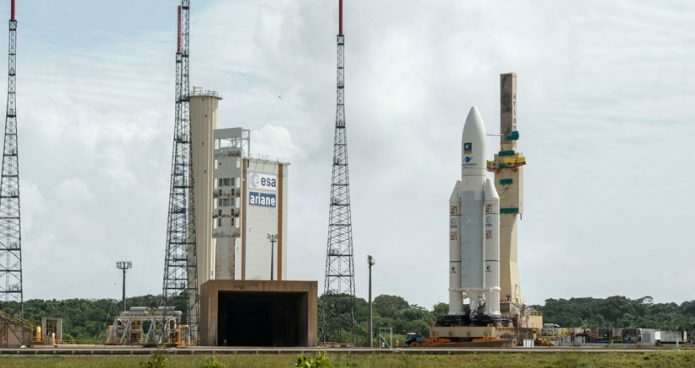 Lifting off at exactly 3:36:07 p.m. local time in French Guiana, the heavy-lift vehicle is to deploy its passengers on a flight lasting approximately 3 hrs., 55 min. Payload lift performance for today’s mission – which is designated Flight VA240 in Arianespace’s launcher family numbering system – is estimated at 3,282 kg. Watch the live broadcast on Arianespace.com.